Avocados have been gaining popularity in the U.S. in recent years. Not only are they creamy and flavorful treats, but also they are nutrient-dense and contain more than a dozen vitamins and minerals. According to a study in the Journal of the American Heart Association, avocados can also fight cholesterol and protect cardiovascular health when eaten as part of a heart-healthy, moderate-fat diet. Here’s why part-time caregivers in Oshkosh should add more avocado into their loved one’s diets. According to the JAHA study, researchers placed participants on three different cholesterol-lowering diets. These volunteers were placed on each of the diets for exactly five weeks and revealed a significant reduction in LDL, also known as bad cholesterol, while eating the moderate-fat diet with avocado. This was a beneficial outcome that strongly contrasted with results from the other diets. 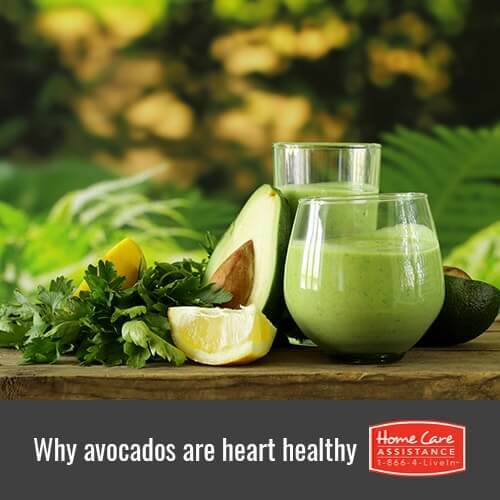 Those who participated in the avocado diet also exhibited favorable changes in their total cholesterol and triglyceride levels. The fat content in avocados comes from mono- and polyunsaturated fats in addition to omega-3 fatty acids, which naturally lower cholesterol levels. Avocados provide approximately 25 milligrams per ounce of beta-sitosterol. Regular consumption of natural plant sterols have been linked to lower cholesterol levels. Avocados are also rich in vitamin B6 and folic acid, which can help lower homocysteine levels associated with an increased risk of heart disease. A 2013 study published in Nutrition Journal also found that avocados reduced the risk of metabolic syndrome, which is a cluster of conditions associated with an increased risk of coronary artery disease and diabetes. Most people associate avocado with guacamole and corn chips. While delicious, this combo is high in calories, sodium, and other fats that are not heart healthy. Instead, try fresh avocado sliced on top of a salad, sandwich, or a piece of lean protein. Oshkosh in-home care providers can also add avocado to smoothies in place of fattening yogurt or other dairy products to maintain a smooth consistency. There are other foods and beverages you can incorporate into your loved one’s diet to promote heart health. To learn more about them, turn to Home Care Assistance of Oshkosh. We provide flexible Alzheimer’s, dementia, and stroke care in Oshkosh in addition to helping seniors with daily activities. Not only do we help seniors around the house, but we also promote healthy lifestyle choices including nutritious diet and physical exercise. Contact us at (920) 710-2273 today to learn more about our services and schedule a complimentary consultation.